Home » Is Joe Ingles Coming To America And The NBA? Is Joe Ingles Coming To America And The NBA? While players performing at the 2014 FIBA World Cup are looking to deliver as much as they can for their country, there is also a lot to be said for the fact that many players will be keen to put themselves in the spotlight. If you are able to deliver team glory while getting praise for your own work, you have to think that you are doing something right and this is exactly what Joe Ingles from Australia has managed. At the moment, the player is basking in the glory of being a key component of his country’s win over Lithuania on Tuesday. This was a shock result with many people viewing Lithuania as one of the favourites outside of Spain and USA. The Australian team and fans talked about their chances of success before the tournament, but many people assumed that this was typical Australian confidence and arrogance coming to the fore. However, this result has caught the imagination and it may be that the team is heading in the right direction for the knock-out stages. While this is brilliant news for Ingles, there is also the fact that the player looks to have played himself into the running for a move to the NBA. There is a lot of talk and rumour at the moment of the player being a strong choice for the NBA this coming season. 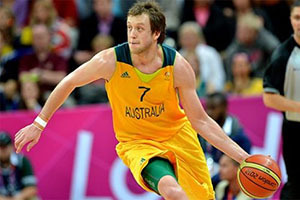 Ingles greatly impressed during the 2012 Olympic Games in London so the fact that he has followed this up with another massive showing at a major basketball event has to be seen as big news. The player is only 26 and is well positioned to finally make the switch. Ingles is unattached after a season with Maccabi Tel Aviv last year. This wasn’t his best season personally but he did achieve club success in Europe and of course, he worked under David Blatt, who is now the head coach for the Cleveland Cavaliers. One poor season, when you have a track record of performing on the big stage, isn’t going to put many teams off and the big win over the Group D favourites on Tuesday has ensures that Ingles is very much on the radar for a number of NBA teams. Will Philly or Memphis be the destinations for Ingles? There is a lot of talk that the 76ers from Philadelphia may be on the hunt for Ingles. This is a rumour that was always going to surface due to the fact that Brett Brown is a coach in Philly and was formerly the national team coach of Ingles. Another team that is tipped to be in the running for the player is the Memphis Grizzlies and the fact that Ingles has played with Marc Gasol, in Barcelona, may suggest that there is a link up waiting to happen. Gasol is a big fan of the Australian player and he won’t have been shocked at the strong showings Gasol has delivered on the big stage in Spain. There is also the fact that the Grizzlies created a little bit of space on their roster at the weekend by waiving Jamaal Franking. This could increase the likelihood of Ingles heading to Memphis although there will be a need for the club to keep an eye on where they are with respect to luxury tax. The club is currently more than $1m below the line but it may be that the capture of Ingles will push them perilously close to the tax range, which may impact on the final decision made by the club.